Hackney has a lot of barbershops. Walking down one 500-metre stretch of Kingsland Road alone, I count five. Xavier de Sousa, executive producer of recent barbering-focused arts event Cut Festival, estimates that there are around 65 barbershops just on Kingsland Road and Brick Lane, East London’s other haircutting hotspot. Gender-neutral and LGBT, queer and trans-friendly barbering are well-represented in Hackney. Open Barbers, founded in 2011, has been operating since last year from a shop on Clunbury Street. Barberette, set up by former Open Barber Klara Vanova, is based in a space near Hackney Downs. 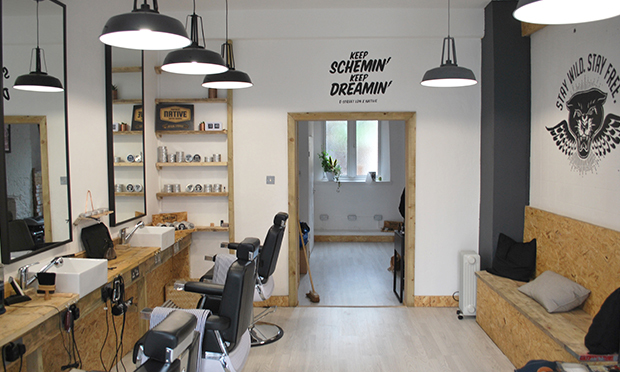 Barbershops with links to other segments of Hackney’s population have also sprung up. Mark Jones opened E-Street Barbers on Lower Clapton Road around nine months ago. Good music as well as a good haircut “are a given” here, says E-Street’s website, and Jones says his shop has built a following among Clapton’s musicians. When I visit, he’s just given trims to a French band performing in Hoxton that evening. Activities beyond cutting hair strengthen barbers’ links to their particular social tribes. E-Street hosts musical events and parties. 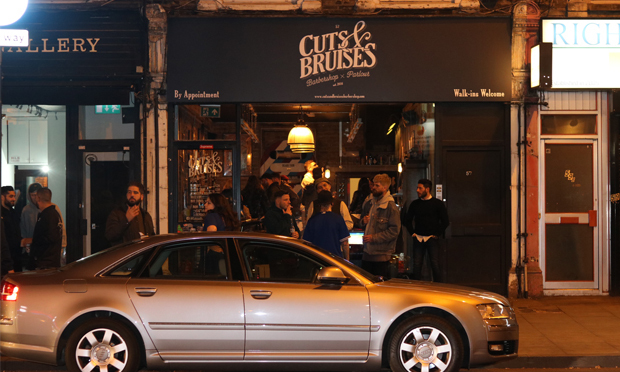 Cuts & Bruises’s basement is destined to become a tattoo parlour next year, and will be a space for events like boiler room DJ sets and streetwear pop-ups in the meantime. Barberette’s many charity and community initiatives have included running a raffle at one of its regular client parties to fundraise for an LGBT counselling service and exhibiting the work of Hackney artists. The simple intimacies of a barbershop’s everyday work foster a sense of community. Barberette’s two-chair space has a vibe that has led to clients connecting for everything from lifts to Ikea to longstanding professional or personal relationships, says Vanova. At Cuts & Bruises, a Nintendo 64 console loaded with Tony Hawk’s Pro Skater and other classic games is a natural focal point for bringing clients and the team together. All the barbers I spoke to were keen to emphasise that anyone wanting a service they offer is welcome in their shop. 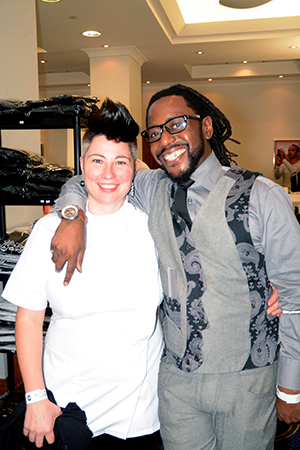 In fact, inclusiveness is something that distinguishes East London barbering, says de Sousa. While a few barbershops here have traditional atmospheres that some find unwelcoming, he thinks they are in general more “open to difference and to differences co-existing well together” than elsewhere. “There’s nothing worse than being intimidated when you go into a barbershop” says Jones. “[At E-Street] we want to create a friendly atmosphere”. Equally good relations with more traditional barbershops are reported. But, thanks to their client bases and pricing, some of Hackney’s new breeds of barbershop risk association with the problematic issue of gentrification. Vanova is concerned about cultural debts that are being forgotten as barbering in Hackney develops. “Just look at the hairstyles, the sharpness of the cuts,” she says. Traditional Afro-Caribbean and Turkish barbering traditions have bequeathed much to the industry, but this is not acknowledged enough, in her view. Both Mehmet and Jones believe their services are subtly different to those of more traditional barbers, but can happily co-exist with other offerings nearby. This could be simply because barbering in Hackney is booming, so there’s more than enough business to go round. All the barbers I visit, or simply walk past, are extremely busy, and Jones even says that he thinks there’s enough potential trade for six more barbershops on Lower Clapton Road alone. Hackney’s love affair with hair is as passionate as ever.